It has rightly been said that medicine is not the only cure to illness; it rather leaves you with side affects at some point of time or the other. Regular exercise is the ultimate way to heal oneself; it is the best manner in which you can get back to your normal self. Experts at Delhi Physio strongly believe that therapeutic treatment of doing physical exercises and other related activities act as a catalyst to evaluate health with proper functioning of the organs. As regular therapy sessions restore body’s normal movements, as a part of Physiotherapy our experienced experts study the conditions of the patient’s body that include posture, body balance and normal movement. Knowledge about the disease helps to provide required treatment to the patients. 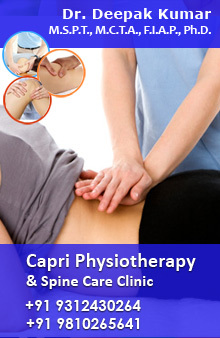 Our expert physiotherapists who are well versed with muscles, bones and nerves, evaluate, diagnose and treat the patient’s illness by carefully adopting various measures and techniques for correcting the complications. We, a unit of specialist who belong to different Physiotherapy fields like Neurology, Pediatrics, cardiology and Orthopedics carefully analyze the patient’s problems and accordingly take the responsibilities for their rehabilitation. Various techniques are put to use in the sessions such as the heat radiation, water therapy, massages, wax bath, traction and ice therapy etc. Besides this, treatment can also be done by ultrasound techniques, acupunctures and electrical stimulations. Individual’s history and records are maintained to keep the track of the day to day progress. Apart from the sessions the therapists also suggest walking, sitting, sleeping in apt positions. Our happiness lies in curing our patients. The results of the physiotherapy exercises are truly fruitful and can bring realistic hope in your life.